Tripp Lite's OMNIX350HG offers medical-grade UPS protection with built-in line interactive voltage regulation, intelligent monitoring and unattended shutdown capability. IEC320 plug & outlets, plus built-in isolation transformer with Faraday shield offers full isolation and removes common mode noise. Tested to CE/IEC 60601-1 as medical electrical equipment. 350VA power handling capacity supports computers, inter-networking equipment and other critical loads during commercial power failures. Line interactive voltage regulation corrects brownouts as low as 159V back to normal 230V levels, saving battery reserves for use only during complete power failures. 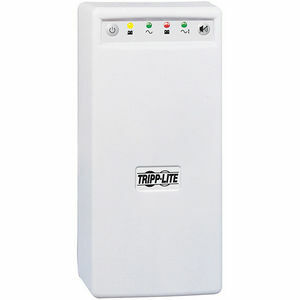 Includes, 2 line phone surge suppression and built-in USB communications port that works with PowerAlert Software and cabling to provide automatic unattended shutdown of connected network and PC applications.